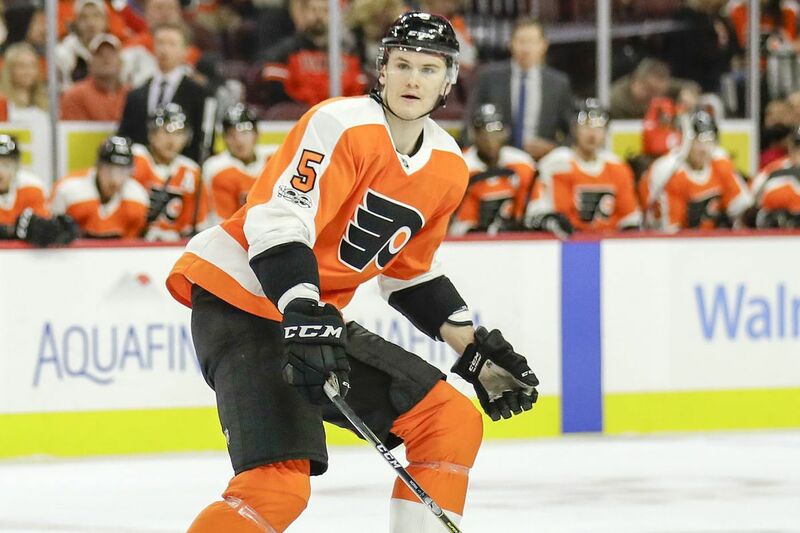 Between his recovery from an ACL tear, contract status and the Flyers' slim chance at a playoff spot, defenseman Samuel Morin has had a difficult time finding his way back to the ice. Their chance to reach the playoffs increased ever so slightly. And the slim chance that we will see Samuel Morin play defense in a Flyers uniform this season virtually disappeared. “I hope I get in at least one,” the big defenseman said before last weekend’s games. Two months ago, that seemed a foregone conclusion. Morin was stepping on the ice for the first time since tearing an ACL in a five-overtime playoff game with the Phantoms last May. That followed a series of hip injuries that had thwarted his and the Flyers’ plans/hopes to have him play for the big club for most of last season. This was the silver lining for a Flyers edition traveling inside of a dark cloud. Mired near or at the bottom of the league, the Flyers were a few more losses from the unofficial start to next season, from playing the remainder of their schedule with next season’s roster as their No. 1 target. Already, interim coach Scott Gordon had expanded the role of some of the young players he knew well from coaching the Phantoms. Already, there were new pairings on defense, new lines issued almost by the game, even the germs of a new attack philosophy. When you are out of it, you play around with such things without the fear of consequence. You stay longer with hypotheses. Maybe these two players will work together if given time. Maybe this young player will become more confident, more productive if allowed some wiggle room for mistakes, allow his game to breathe a little bit. An ideal situation for their first-round pick of 2013 (11th overall) to press the restart button on his career. And then the Flyers went on their two-month tear, and the timetable for Morin’s return became muddled. He was loaned to Lehigh Valley for a couple of games in mid-February, his first real action since May. But he would have to clear waivers if he is is to play there anymore this season, and the Flyers will not chance that. And so he practices. Practices like he would play in fact, which isn’t always well-received by teammates who are playing every game as if they are in a playoff. Morin is 6-foot-7, and despite having played in just three regular-season games as a Flyer over the last two seasons, his thundering hits from those games and preseason ones are already Bunyanesque moments for fans. There are 10 games left to the Flyers’ season. Oddsmakers say the chance of them accumulating enough points to overtake the two teams in front of them is less than 3 percent. But they’ve worked hard to get even that 3 percent, and until it shrinks to zero, Morin will have to remain a speculative stock. Morin said he understands this. So he waits. Healthier than he’s been in two years. Waiting for that slim chance to fatten again.